And since I have a paycheck coming in every month, I don't have to go on a book buying ban as often as I used to. But now I have a whole different problem: I keep buying all the books in a series and not actually reading them, which results in me having whole sets of completed series that I haven't started the first book from. Which brings me to the title of this post: my shelf of shame. It's an actual shelf on Goodreads too, called own-full-series-haven't-started-first-book. Because I noticed it was becoming a thing and I like to keep track of things (if you read this post, you probably already knew this). As of today, I have 15 series that I own that are completed and I'm ashamed to say that I haven't even begun reading the series yet. So, what I'm really asking you is: do you guys do the same? Tell me I'm not the only one going a little crazy hoarding books sometimes? Also, if you took the time to click the link to my Goodreads Shelf of Shame, which series would you recommend the most from this list? Well, I sure can't afford hoarding paper-back books, but I sure do have my own *cough* little *cough* e-book collection of completed series I haven't started yet. It's good to see that someone else is just as weak when it comes to books and staying away from them as I am. But you HAVE to buy the whole series because! What if you buy the next book in the series much later and they messed around with the design and it doesn't match up anymore?! You most definitely are not alone, I have loads of series like this but most of mine are fantasy book series. I do it as I know if I read one book knowing there was a sequel and didn't have the next one I'd get annoyed and angry so it's better for my health (and my husbands) if I buy all the books in said series before reading them..... much safer for everyone involved! The only ones from your shelf that I have read myself are the Garth Nix Abhorsen books and I loved them! But why in the world didn't you read the infernal divices?? It is a great serie. You really should read it. I do the same thing, if it sounds like a series I will enjoy I purchase all the books before even starting the first one. I can't stand the idea that I am loving the series but have to wait to go buy the next book, instead I want to just pick up the next in the series after each book I finish with no waiting time. I think I have 4 or 5 series that have 6 or more books in them. I am working on fixing that though this year with the Series Challenge. I was guilty of downloading ALL the books at one time, more than I can possibly read in this lifetime or the next. Now that I've gotten a better handle on my habit, it's maybe 1 or 2 a month. I can manage that; I'm not overwhelmed, and it gives me time to finish up the other 5 books I have going before moving on to something new. Looking at your shelf, I say start The Archived series. I just started it last night. It's weird, but in a good way. Almost a bit too 'spooky' for my taste, but I'm liking so far that it's a departure from what I normally read. Gotta mix it up! Oh, don't I know EXACTLY what you mean! In point of fact, I just now got back from the book shop and bought 4 books in a series that I've only heard of, but really have no idea whether I'll like! As for your list, I would recommend getting started on Abhorsen or Eon/Eona (Last Dragoneye), which I read almost by accident recently and really loved! I would start with the Abhorsen series... and not because it's the only series on your shelf that I've read myself, but because it's pretty awesome. I remember binge reading the series the summer before I left for college. I was borrowing them from a friend and even though I read them very quickly it took me over a year to get them back to her. But since you already have them all that won't be a problem. Just go for it! You won't regret it. Sadly, I do have to admit to sometimes doing this very same thing. Not all the time, but yes, if there's a series I'm starting or plan to start I tend to prepare for potential binging. I mean, what if I start a series and it's amazing and I finish a book in the middle of the night and absolutely must start the next one right away. I have to have it in hand, right?! Right?! But yeah, more often than not it just means the whole series sits in the TBR without being touched for a ridiculous amount of time. I don't have whole series on my shelf or in my ereader but I have a bad habit of starting a series and never finishing them. I wish my goodreads shelf was as organized as yours..huffs..maybe I should designate a day to goodreads organization..lol. The Legend and Ascendance Trilogies are pretty small and easy to get through if you're looking for quick reads. I read the entire Legend story in a few weeks last year! Same with the Paranormalcy trilogy, it's really cute! I am not one for series, per say, but I do have a problem buying books, placing them on the shelf "to read", then never get around too actually reading most of them. I have just as many unread on my shelf as read. ABHORSON TRILOGY!!! It's is one of my all time favorite series!!! I didn't realise it was 15% off on pre-orders! I always wondered why they went up in price haha. But I hate pre-ordering because they seem to cause shipping issues for me. Oh honey, I share your pain, I truly do. It's bad. Based off of my own experiences, I would suggest you start with Victoria Schwab's ARCHIVED series. The books are good and (I'm told) conclude in such a way that you won't be left hanging even though the third book's fate remains in question. Also, if you find that you adore her writing, she's prolific enough that the rest of her works will keep you busy while you wait for that third book. I've heard really good things about Garth Nix's series as well, but I (own but) haven't read them yet. I don't do this with series. BUT I have bought three or four (maybe more) of works by an author I've only read one book by...or maybe not even read any books by. The worst? I've only read two(!) complete Faulkner novels and I own almost his entire collected works. I own four Zola books, but I've never even read anything by him. I really need to stop because I need to be saving because my income is going to be cut in half before too long. The Abhorsen trilogy is really fantastic. Of the others, I've read the first Beautiful Creatures and it was okay. And I've read the first of Ally Condie's which I didn't like at all. But I haven't read any of the others!! Good luck getting through your shelf! Prophecy of the Sisters is pretty good. I also really like the Paranormalcy series. The Abhorsen Trilogy is one of my favourites of all time, I really recommend it! I totally do the same thing. I have lots of series, full series, that I have to start reading. That's one of my goals this year to do- focus on those. Because what if, OH NO!, i don't LIKE the first book? And I bought all of them? Sadness my friend. So I hope I like all of them, I hope I start to read all of them this year (or at least a good amount) and I really need to stop doing that. There have been series I've had all of them and then didn't care for and all I kept thinking of was that I could have bought other books with the money I wasted. Good luck with this pile! You're never alone in this book blogging universe of ours. Lol. But I'm totally the same. So many series I've yet to start just sitting there staring at me. Pick me next! I better love them because I now have to read the whole series either way. Although I really love The Ascendance Trilogy too. I do this too. If a book in a series that I want to read becomes a kindle deal, I pick it up. I almost have the entire Mortal Instruments series. I haven't read book one yet. I hope I like it! I am the same way. And I don't even work right now since I'm on maternity leave. Thankfully, having a baby has opened my eyes and I've only bought three books this year. 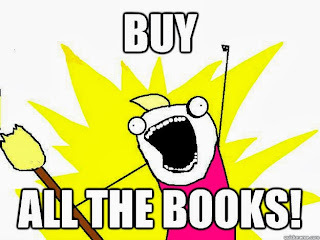 I'm being a LOT more critical when I look at books on sale, thinking if I really need them or not. Usually not. I'm using my library a lot more AND working on a lot of the books on my bookshelf (er, bookcases) of shame. I think for me it was book blogging that got me into needing to buy all the books, mainly having a post like Showcase Sunday or In My Mailbox. I felt like I needed to buy a lot of books to have an epic post -- and that would happen every week. I'm glad that I've gotten out of that mindset and now only try to buy the books that I really, really want. And I was terrible for series, too. I don't know how many full series I have on my shelf unread, but it's more than a couple. I use to do what you do and was a terrible hoarder until I lost everything. While i do have a massive TBR shelf this is one thing I don't do because every time i have done this I end up hating the series and then I'm stuck with all the other books that I am never going to read, though if i have read the first and loved it then i will rush out and buy all the others and a lot of those still reside on my TBR shelf. You need to read The Heir Chronicles they are one of my all time favorite series and they are awesome! I have the same problem. I want to OWN THEM ALL and especially a series, even if I'm not caught up, or read most of the books. I did that with the Hollows and Mercy series where I met the authors and got their most recent books signed (in hardback, gross) and then had to start my collection of all the other books I didn't have yet. Well that was a few years ago, and I still haven't read those series. So, I NEED TO STOP. And we both need a support group lol! Any time you start feeling too bad, think of me. I have hundreds - literally hundreds - of unread books on my shelves, including many, many series. I'm a bad bad book buyer. I think we all do this. I own several books in many series that I have yet to start. I think I bought all of Vampire Academy before I read the first book and also bought some of the Bloodlines series even though I had no idea if I would like it or not. 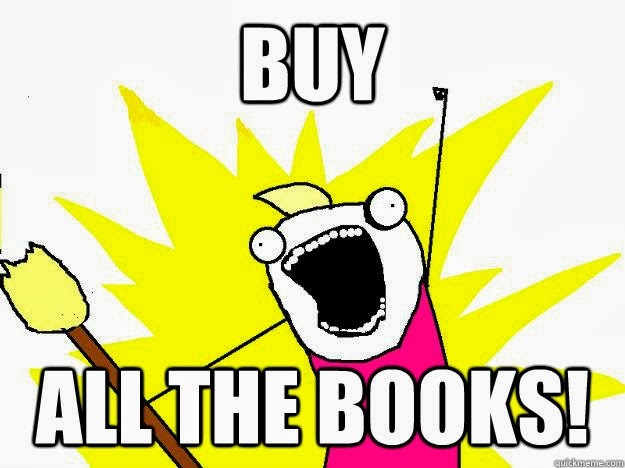 I also go a little crazy and buy the next several books in a series to "have them on hand" as you said. You never know when you will want to read the entire series back to back and if you don't own all of them how could you possibly do that. I feel your pain and I would start Legend by Marie Lu! Count up another vote for the Abhorsen trilogy. ,They're fantastic. More OT, I don't do this, but I've only started being able to buy my own books in the last few years, and I'm still all about trying out a series at the library first. I'd vote for the Legend series! :) I really enjoyed it and after a couple of dystopian series that disappointed me with the ending, I came away pleasantly surprised by Marie Lu. I have certainly been very bad about this in the past. I succumb to hype and convince myself that I absolutely will need to tear through a series and buy the whole thing in one go. Luckily, most of the series I have done this with have been to my liking. But now I try to talk myself down before buying all the books, and hold off until I've at least read the first one so I know it'll be worth my time and money. I'm right there with you, I've always been one of those that buy a complete series with every intention of reading them, but then I spot something else to buy. I have absolutely no self control when it comes to books, I used to be the same with DVDs, but I've gotten better with that. I have a bookcase of shame O.O, there are some authors which are automatic buys, so that doesn't help the situation either. Because I've been burned a couple of times now, I don't tend to automatically buy a full series anymore, (unless it's an absolute bargain that I can't pass up). I don't think I'll ever fully grow out of it, but I need to remember that I can borrow books from work instead of buying every single book! It's my sister from another mister! Not only do I adore lists, but I too have a compulsion to BUY ALL THE BOOKS! For real. Even if I stopped buying books tonight (pssht, so not happening) I could be happily kept in books for years. YEARS! But you know the apocalypse could start tomorrow and where would you get your books then? Oh right. The horde pile you so thoughtfully prepared just in case. ;) No, I don't think your alone but I have stopped doing the series thing because I'm primarily an ebook kind of girl so there is no legitimate reason for me to purchase books ahead of time because ebooks are instant gratification.